If you’re looking for a basic, no frills secured card to help you build a long-term credit history – and you don’t plan on carrying a balance – then the Citi Secured Mastercard could be just the kind of card you need. This plain vanilla credit builder card stands out from much of its competition because it doesn’t charge an annual fee. That not only makes it less expensive to own; it also makes it a good long-term credit card, since you can keep it open for years without paying anything extra. The longer you own and use a credit card, the more it will help your credit score since lenders like to see a lengthy, positive credit history. Other secured cards, by contrast, charge fees as high as $35 to $49, making it tough to justify carrying the card for more than a few years. Don’t plan on using this card to finance purchases, though, since its APR is very high. It also charges bigger fees than many of its competitors and doesn’t offer any rewards. Like all secured cards, the Citi Secured card requires you to put money down to secure your card in case you fall behind on bills. Citi also requires a minimum deposit of $200, which is lower than what some lenders require, but is still relatively high. If you don’t have $200 freely available, you’d be better off picking a card like the Capital One Secured card, which allows you to put down as little as $49, depending on your credit score. The Citi Secured card does allow you to set your own credit limit, though, based on what you can afford to put down as a deposit. 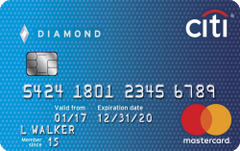 Citi allows cardholders to put down up to $2,500 and will match whatever cardholders invest into the card. That’s a nice perk for cardholders who would otherwise receive a much lower limit. However, a $2,500 credit limit is still relatively low, compared to what’s available on other cards. If you can afford to put down more than $2,500 at a time, you may want to look for a secured card that allows for bigger limits. A higher limit paired with a low balance can add a significant number of points to your credit score. Like many secured cards, the Citi Secured Mastercard doesn’t offer a rewards program. So, if you’re hoping for points or a little cash back in return for your spending, then you’ll want to look at other cards. The Discover It Secured card, for example, offers a modest cash back program. Meanwhile, U.S. Bank offers a number of secured airline cards, such as the AeroMexico Visa Secured card and the LATAM Visa Secured card, that award air miles in exchange for spending. If you’re just looking for a card to establish a positive credit history, though, then this is a good one to start out with before you move on to more generous cards. The Citi Secured card is an especially good pick for young cardholders who have an interest in building a positive credit history for the long-term so that they can later qualify for a mortgage, car loan or other big loan. Since it doesn’t charge an annual fee, you could potentially use this card as a starter card and then continue to keep it open, long after you’ve moved onto better cards. That will help your credit score since the older a positive account is on your credit report, the more it will benefit your score. If you close the oldest card in your credit history, by contrast, you’ll inadvertently shorten the age of your accounts, dragging down your overall score. The Citi Secured Mastercard doesn’t offer great benefits, though, which is disappointing. Unlike some competitors, it doesn’t offer car rental insurance or emergency trip protection, nor does it offer free credit scores. It does offer fraud protection, however, and assistance if you become a victim of identity theft. This card is for consumers with limited or nonexistent credit. You should be able to qualify for it, even if you’ve stumbled badly in the past. That’s one of the great things about secured cards: By putting some financial skin in the game through your deposit, you lessen creditors’ financial risk and make them more willing to welcome, rather than reject, you. Why get the Citi Secured Mastercard? You want a long-term card without an annual fee. You aren’t interested in card rewards. You want more control over your credit limit. Avoid charging more than you can afford to repay in full. The APR on this card is steep. Expand your available credit by securing the card with as large a deposit as you can afford. Don’t close this card once you’ve improved your credit and upgraded to better cards – especially if this is your first card. Accounts with long, positive credit histories are great for your credit score.